It is widely believed that the first Matteson to come to America was Henry Matteson who arrived at Portsmouth, Rhode Island in 1666. 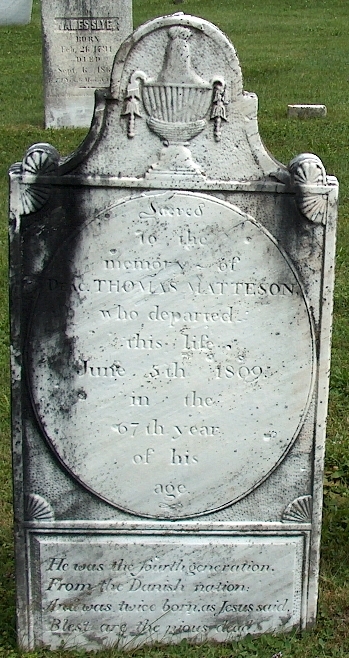 Henry Matteson the immigrant, the first ancestor of nearly all Mattesons in America, lived on Prudence Island at the beginning of his new life in America. Evidence of Henry Matteson on Prudence Island. Henry married Hannah Parsons daughter of Hugh and Elizabeth Parsons about 1670 and fathered 7 children that we are aware of; Henry, Thomas, Hannah, Joseph, Francis, Hezekiah, and Josiah. In 1675, King Phillip's War, named for the Wampanoag leader Metacom (also known as King Philip) broke out in the town of Swansea in western Plymouth Colony. Hostilities quickly spread north and west, soon threatening much of New England. The war ended in 1676 when Philip was killed by a Wampanoag soldier in Captain Benjamin Church's force. After King Phillip's War Henry then moved to East Greenwich. Incorporated in 1677, East Greenwich, or Green Town, was named after Greenwich County of Kent, England. It was renamed Dedford in 1688, but quickly reverted to the original title in 1689. The original tract of land consisted of 5000 acres. Of that, 500 acres was set aside near the sea for the formation of a town. This land was divided into 50 house lots. The remaining 4500 acres was divided into 50 great divisions. For services rendered during King Philip's war the early settlers of East Greenwich each receieved one house lot and one great division containing in whole one hundred acres. In 1709 the boundaries of East Greenwich were enlarged with the addition of thirty-five thousand acres of land on it's western border. This land becoming West Greenwich in 1741 when the township was divided into the towns of East and West Greenwich. On April 22, 1678 Henry served as town Sargent for East Greenwich. On June 12, 1678 in East Greenwich Henry acquired 100 acres of land that had been granted to John Pearce. Voted, Upon the petition of Mr John Pearce Mason, that he may be dismissed as the Court's grant to him for lands at East Greenwich, and that Henry Mathewson may be accepted in his roome, the said petition is granted, and the said Mathewson is accepted in the roome of said John Pearce, he the said Mathewson performinge the Assembly's former injunctions concearninge the said lands. He later sold this land to David Shippee on March 17, 1682. On February 24, 1684 in East Greenwich Henry was recorded with testimony, that his age was 38 or thereabouts which would indicate Henry was born in 1646. In 1685 Henry served as a Deputy to the General Assembly. Henry died in 1693 and is buried in West Greenwich, Rhode Island. On July 29, 1693 Hannah sold to George Vaughan 10 acres of land which her husband Henry had bought of John Knight. There was no mention of a dwelling house being located on this land at the time Hannah sold it to George Vaughn so it is unlikely that this was where Henry and his family were living at the time of his death. Henry's oldest son Henry filed a quit claim on this land absolving himself of having any claims to this land allowing Hannah to sell the land to George Vaughn (during that time period women were not allowed to own property and the land would have passed to Henry's oldest son Henry). More likely Henry was living elsewhere with his family at the time of his death and that land was passed on to his oldest son Henry following tradition. Most likely this is the site of the Matteson Family Cemetery (WG076) where Henry and his eldest sons Henry and Thomas are all buried. On August 9, 1693 in East Greenwich Hannah married as her second husband Charles Hazelton wearing nothing but her shift. Asa Matteson b. 1837 d. 1896 who lived and died in Galesburg, Knox County, Illinois had Denmark mentioned in his obituary as being from an 'an illustrious ancestry in Denmark'. Asa A. Matteson, a Companion of this Commandery of the First Class by inheritance, departed this life on Saturday, the 4th day of January, 1896, after an illness of one week. He was born in Warren County, in this State, on the 24th day of October 1837, and was able to trace his lineage through the early pioneers of New England to an illustrious ancestry in Denmark, on the Matteson side, and, on the mother's side, to the Ogden family of England. Mr. Matteson had the misfortune to lose his right arm in his early boyhood. His father died before he was eight years old, and his mother and family soon after removed to Galesburg, Knox County. These two Mattesons living hundreds of miles apart and being descended from two different sons of Henry the immigrant both mentioning the same place of origin of their ancestry lends support to the belief that Henry was originally from Denmark. The Matteson family of Rhode Island is of Danish origin, and was established in Rhode Island in the year 1678, by Henry Matteson, who was born in Denmark, in October, 1646, and died about 1690. He was of Prudence Island, and removed from there to East Greenwich, R. I. No relationship has been traced between Henry Matteson and Francis Matteson, who on June 2, 1657, were granted accommodations with a house lot at the further end of Ship Cove, in Providence. Henry Matteson was the progenitor of the well-known Rhode Island families of the name, and it is to him that Mrs. E. Ellen (Matteson) Spencer traces her lineage. Henry Matteson, the immigrant ancestor, was born in Denmark, in October, 1646, and died about 1690. He was of Prudence Island, and removed from there to East Greenwich, Rhode Island. On June 12, 1678, he took one hundred acres of land that had been granted John Pearce, mason, the assembly permitting the transfer. He sold his dwelling house to David Shippee, March 17, 1682, with one hundred acres of land. In 1685 he served as deputy to the general assembly. Hannah Matteson sold to George Vaughan, July 29, 1693, land which her husband Henry had bought of John Knight, carpenter, amounting to ten acres. No relationship has been found between Henry and James Matteson, who on June 2, 1657, was granted a house lot at the further end of Bayliff's Cove in Providence. Henry Matteson married Hannah Parsons, daughter of Hugh and Elizabeth (English, widow of William English) Parsons. She married again August 9, 1693, Charles Hazleton. Children: i. Henry, mentioned below; Thomas, of East Greenwich, died January 19, 1740; served as deputy in 1717; married, November 14, 1695, Martha Shippee; had six children. 3. Joseph, of East Greenwich, died 1758; married (first) Rachel , married (second) Martha, who died after 1757; had eleven children. 4. Francis, born March 15, 1680; of East Greenwich and Warwick, Rhode Island ; deputy in Warwick in 1734; died 1750; married. May 12, 1712, Sarah Nichols, daughter of Richard and Phebe Nichols, had ten children. 5. Hannah. 6. Hezekiah, of East and West Greenwich, died 1752; freeman 1720: married Margaret Westcott, daughter of Zorobabel and Jane Westcott, had seven children. 7. Josiah. "For Denmark the period 1560-1720 was dominated by the intensified rivalry with neighbouring Sweden for the position as the leading Baltic power. Denmark had hitherto held this position, as was symbolically reflected in the charging of Sound Dues, which were not abandoned until 1857. The rivalry triggered six wars between the two nations (1563-1570, 1611-1613, 1643-1645, 1657-1660, 1675-1679 and 1709-1720). After Denmark had been weakened by Christian IV’s unsuccessful intervention in the Thirty Year War (1625-1629), the conflict developed into a struggle for survival on Denmark’s part, and for a while the country was on the point of becoming part of a large Swedish Baltic empire. This fate was only avoided because the Netherlands and England intervened, but the price was the ceding of all Scanian provinces east of the Oresund in 1658. The total area of the kingdom was thus reduced by almost a third and the population declined from 800,000 to 600,000. The catastrophe caused a political crisis which in 1660-1661 brought about a new form of government. By coup-like means, the old elective monarchy dominated by the aristocracy was replaced by a hereditary monarchy. The new hereditary king, Frederik III, and his successors gained absolute power. The king’s unrestricted authority was subsequently codified in the Royal Law of 1665, which in general remained in force until the abolition of absolutism in 1848 and the adoption of a democratic constitution in 1849. In 1683, the Royal Law was supplemented with a Statute Book applying to the entire country, King Christian V’s Danish Law. Insofar as the means were available, Denmark was transformed into a well-organised bureaucratic state under the paternal leadership of the absolute monarch."